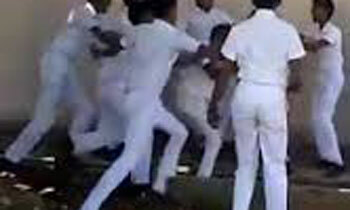 At least eight students were hospitalised after a clash between students of Ananda and Nalanda Colleges in Colombo yesterday afternoon, police said. They said five students from Ananda College and three students from Nalanda College were among the injured due to the clash that occurred in Borella and Maradana Police areas. The injured were admitted to the National Hospital, Colombo. Five students were arrested by the Borella Police and ten students from the Maradana Police in connection with the incident. Police said a CTB bus and another private bus were damaged due to the clash in Borella while a car and a van were damaged in Maradana.